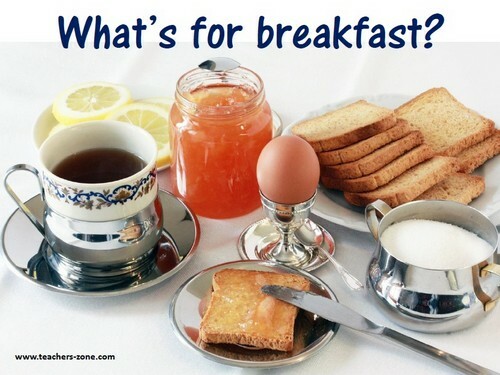 CLIL lesson plan to teach students that breakfast is the most important meal during the day. Your students will have an oportunity to practise food vocabulary as well. 1. The lesson is started with a small talk about breakfast as the most important meal of a day. Ask if and what your students have for braekfast. 2. Then introduce or revise some food vocabulary with flashcards. Click here to download free flashcards. 3. After that ask your students to prepare their healthy breakfast - draw pictures and label them or write short descriptions. Click here to download the printable worksheet. 4. Ask your students to share their ideas on healthy breakfast in pairs. Hi - thanks for this. But I think that in general, CLIL activities should emphasise (as priority) the learning objective. You say 'to teach students that breakfast is the most important meal of the day...' but that's not strictly true. That is a more complex objective and the contents of this lesson do not (necessarily) fulfil that. What will the students 'LEARN'? (better). Well...they'll learn that a healthy breakfast consists of X and X and that 'my healthy breakfast' is X. So the objective is 'The students will identify what food-types make up/constitute a healthy breakfast and then choose their own healthy breakfast from the options offered' The language arises from that objective. It's not the primary objective of the activity. If it is, it's not really CLIL. Apart from that, the materials are great!